Last week the guitar recording poll came to an end, so it's time to present the results... 126 voters participated in the poll and three options stand out from the crowd in the results. The full results are shown in the picture below. As you can see, following on these two top categories a lot of you use a mobile phone to record on. I used to use a small USB stick size mp3 player, but I recently switched to my mobile phone's voice recorder to record my acoustic practice. It's portable, quick and easy to use, and gives reasonable results. I also use my computer to record stuff at home, simply plugging a jack into the PC line or microphone input. There is plenty of different recording software around, but I have always had good results with Audacity. 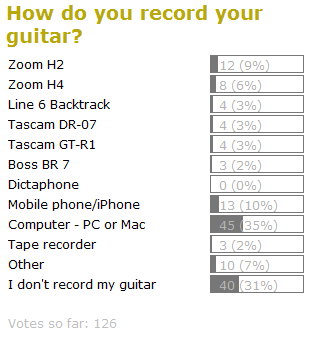 For band practice we use a Zoom H4 which is quite popular among the digital recorder votes. The H4 gives good results recording an amplified band in our rehearsal room, managing to capture a well-balanced sound from the mix of amplified instruments and acoustic drums. There are many different ways to record your guitar practice, some more suited to particular situations than others. If you already have a mobile phone or computer then you can do a lot of quite satisfactory recording for almost no effort or cost. Why not give it a try...?